How might we communicate AI-driven innovation into the core brand and product experience? Scouted is an AI-powered recruiting platform that matches talent and companies based on profiles far deeper than a resume or job listing. Doberman worked with Scouted to create a new brand identity and product experience that clearly communicates Scouted’s unique value proposition. As a UX design intern, I created wireframes, led usability testing sessions and interviews, wrote user stories. I also had the opportunity to get into detail design. Along the way, I wrote essential copy for the marketing pages, onboarding and more. Scouted uses complex, thoughtful algorithms alongside human expertise to match job candidates and companies. But their users couldn’t see this effort. Through a robust platform that helps users optimize performance and decisions every step of the way, via smart coaching and data insights. We worked with the Scouted team to map out their entire service blueprint. After identifying the biggest pain points intersecting the product and service, we created a 4 sprint schedule between the candidate user flows and company user flows. Below are the main touchpoints that we designed, and the hearts indicate where I contributed to design and copy. Today, I’ll talk you through our design process for the Company Dashboard. The dashboard is where recruiters spend most of their time. It’s where they manage tasks, add new jobs and monitor candidate lists. 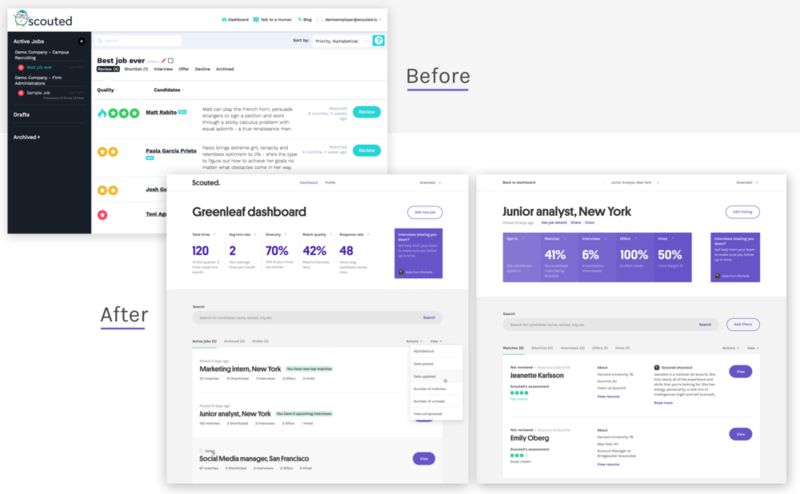 We took the clunky previous version and optimized for smart analytics, information hierarchy that aligns with current user behaviors and a cleaner components that reference back to the rest of the product system. This was one of my favorite deliverables of the project, and one where I spent a lot of time! For companies aka hiring managers looking for a more efficient and effective recruitment process, how can we make their job listings dashboard work harder and smarter for them? The previous dashboard did not communicate all the value that Scouted could provide. Beyond ratings and candidate summaries that weren’t very trusted, it wasn’t designed in a way that helped with decision-making. This allows you to get analytics and view items by status for all job listings and each specific listing. The old dashboard nested each job listing into a left-side menu, with the right window displaying one job listing at a time. This was a missed opportunity to show users an overview screen of their performance and tasks across all active job listings. We brought in some key features to help users manage their activity effectively. 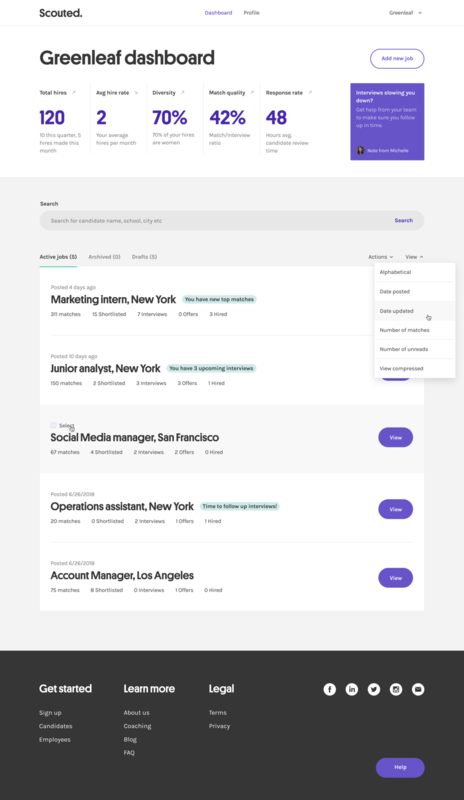 An activity section to surface urgent tasks from the get go, and advice cards and an analytics pipeline to give users an idea of their overall hiring performance. 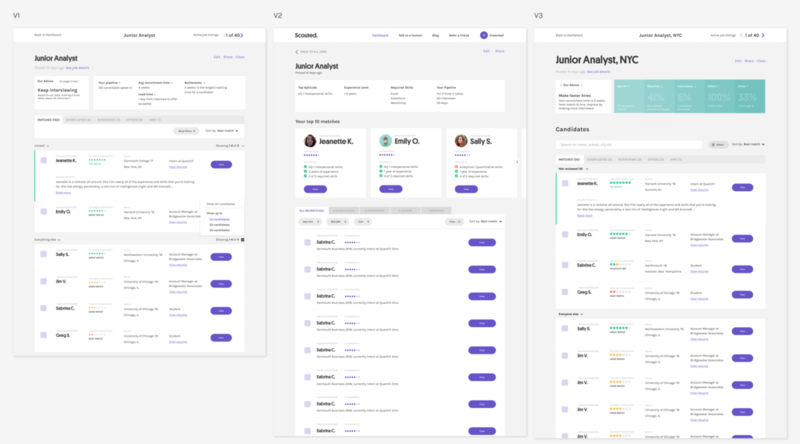 The concepts were well-received but we learned that the advice/pipeline needed to be more easily readable at a glance, and the job listings were ultimately the most important section of the page. This led us to fold task notifications into each job listing component instead. We played around with many different versions of the layout, knowing that users wanted to view new listings first, then top candidates. The top area began with just the job description and criteria, then evolved into a full analytics pipeline that included the job listing, the ability to share the listing with co-workers and close the job. I dug deep into what information users need to see in each candidate listing to make a decision to view more or move forward. There were three areas of exploration that I helped wireframe and prototype. What top level info sets the tone? What do users need to make quick, informed decisions? Designing for frequent return visits, we wanted to make sure the job listing dashboard did three main things: quickly show users the quality of hiring progression, guide them to new and top candidates, and help them effectively make decisions and adjustments. The main user task was inviting candidates to an interview. Therefore, it was key to display candidate listings so the process was efficient and informed. Through user testing, we realized quickly that users wanted to make judgments for themselves rather than being pushed towards curated “top 10” lists. Though they did want to be equipped with Scouted’s assessment, quick facts and access to resumes. They treated the candidate listings like line items—filtering through new, unreviewed candidates first, shortlisting top candidates and archiving low candidates. This top area needed to provide practical information that helps users evaluate the candidates listed below. Through multiple iterations, we decided to use “Our Advice” as a space for Scouted to automate suggestions for certain users based on back-end data trends. 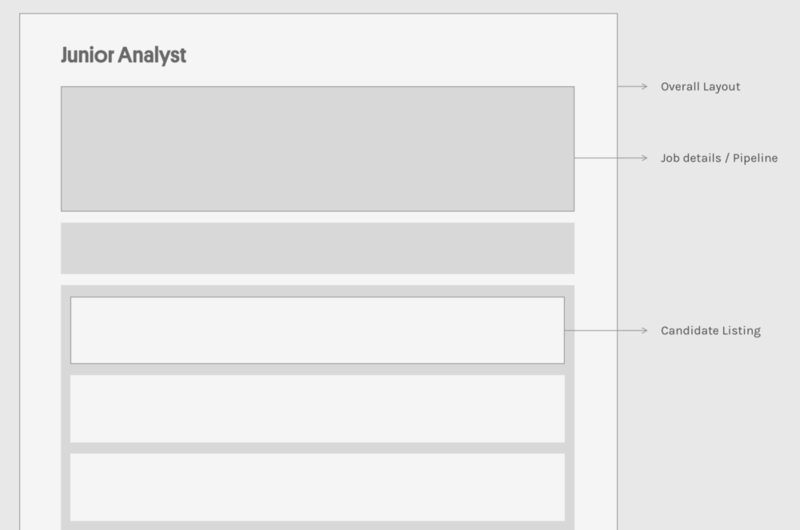 We also included analytics of the users’ hiring pipeline for the specific job listing, mirroring the dashboard overview. Secondary links let users review the job listing details for reference as well as edit, share or close the listing. We wanted to provide the right information that would help users make decisions efficiently. We played around with the ratings UI, match assessment details, Scouted shoutouts and quick facts. Ultimately, we decided to keep the green, yellow red ratings. Users preferred basic quick facts with a link to the resume—a key deciding factor. Top candidates received a Scouted shoutout.